You may have seen an article floating around about the movies on Netflix that are too scary for people to finish. I think a few items on that list are there due to gore and low quality, but I can say that when I saw The Conjuring in the theater (to review it for this paper), I was tempted to walk out. I’m glad I stayed, seated between two horror-buff friends. That film is well made and very scary. This week, I’m offering reviews of three horror films on Netflix: one good, one middling, and one terrible. This Spanish horror film is based very loosely on a police report, and tells the story of Verónica (Sandra Escacena), a teenage girl who uses a Ouija board with her friends during an eclipse and unleashes a dark force that follows her home. Verónica is already spread thin caring for her younger siblings (Bruna González,Claudia Placer, and Iván Chavero) while their mother works, so trying to get rid of a demonic presence pushes her to the brink (and maybe further). Verónica features a haunted apartment, a blind nun, and a stressed out teen. It takes these classic elements and builds on them with vivid nightmares, an interesting set and superb performances. The four young actors have great chemistry as siblings and each deliver strong performances, bringing to life the unsettling, uncanny story. I especially liked how the film’s ending led me to question if the events were real or if Verónica had cracked under pressure and teen angst. Verónica is definitely worth a screening and I bet that you will end up googling the case afterward, too. Verónica was written by Fernando Navarro and Paco Plaza, who also directed. In The Open House, Logan (Dylan Minnette) and his mother, Naomi (Piercey Dalton), move to her sister’s remote mountain house after a sudden death in the family. The house is up for sale, so they can stay for free as long as they are gone for the open houses. After objects move from where they were left and the hot water keeps getting switched off, Logan starts to suspect someone never left after an open house. Meanwhile, the odd neighbor (who maybe has dementia), Martha (Patricia Bethune), keeps stalking around the property. The Open House plays with a natural suspicion about opening one’s home to strangers, and it does so with a decent amount of suspense. It also plays interestingly with Logan’s grief and the impact it has on his state of mind and his relationship with his mother. 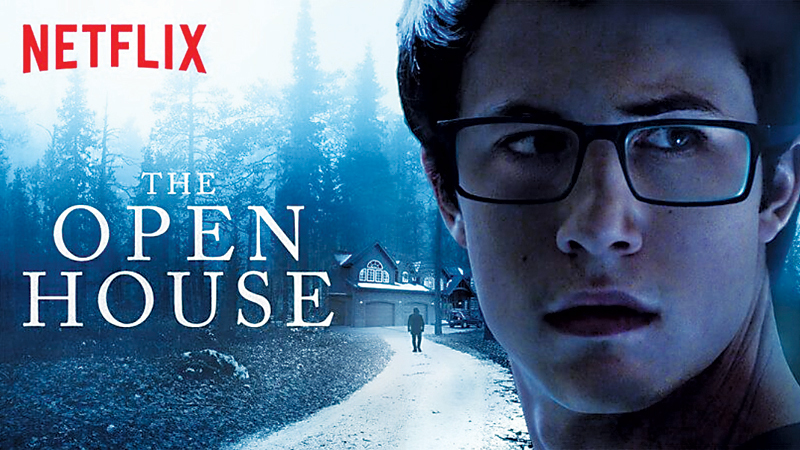 Dylan Minnette delivers a fine performance, not far from his work in 13 Reasons Why. In the end, though, this movie goes so off the rails that it threatens to ruin the good suspense it had built up. It’s not an especially good movie, but not a bad way to pass 90 minutes. In The Ritual, a group of friends (Rafe Spall, Arsher Ali, Robert James-Collier, Sam Troughton, and Paul Reid) wants to find a more active way to connect for a men’s trip, so they decide to hike on a remote trail. Very rugged. So much self-discovery. The group stumbles into a trap laid by a secluded cult and are tortured to death until one of them is offered to a monster as a sacrifice. This movie is like a bunch of different tropes mashed together. A little of The Descent, a dash of Deliverance, seasoned with a bit of any buddy travel film. It’s bad, and boring, and gross. The characters are so poorly developed that I struggled to keep them straight. You have a problem on your hands when instead of being scared by the monster, I was trying to figure out what exactly it was supposed to look like. Monster design is important, and this creature was so bizarre looking, with so many joints that it missed scary and veered toward nonsensical. After all the torture, the big reveal at the ending was insultingly bad. The Ritual was written by Joe Barton based on the novel by Adam Nevill and directed by David Bruckner. She is proud to be a Ft. Wayne native, a graduate of Homestead HS, Ball State University & Miami University.She became involved with journalism editor-in-chief for her high school magazine. She authors the "At The Movies with Kasey Butcher" review.